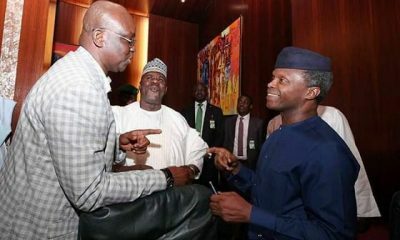 The Ekiti State Governor, Ayodele Fayose, has written a letter to the Acting President, Prof. Yemi Osinbajo, demanding the release of the report of the panel that investigated corruption allegations against the suspended Secretary to the Government of the Federation, Mr David Babachir Lawal. Fayose’s demands are contained in a July 11 letter, which was reportedly received at the Acting President’s office on July 13. The governor was further quoted as saying, “The government’s war against corruption lacked credibility and has thus floundered because of the government’s perceived penchant for sweeping allegations of corruption against top functionaries of the Federal Government and members of the ruling All Progressives Congress. Fayose said it would be unfortunate if the report was abandoned. “The preferential treatment given to the two top-notch members of your government is bad enough. So reckless and audacious has your government become in this regard that a serving senator who is a member of your party said on the floor of the Senate that your government uses insecticide when dealing with alleged cases of corruption involving members of the opposition but applies deodorant when members of the ruling party are involved.